As popular as Halloween is, and as much as many people associate it with horror films and scary monsters, there aren’t many films that pertain to the holiday in particular. John Carpenter’s classic started a trend in which horror films took on the moniker of other beloved festive days, including St. Valentines Day (My Bloody Valentine), Christmas (Black Christmas), even April Fool’s Day (April Fool’s Day). When I hear of a film that takes place on the day for tricking (no, not William Friedkin’s Cruising. I mean a different kind of tricking) and treating, I instantly will add it to my queue for viewing on a brisk autumn evening. When I came across today’s film and it’s myriad of sequels in the local video store, I decided to set aside the original intended film (that will come tomorrow), and give the first in the series a spin (or an insert, as it were. Although that has a different connotation entirely). A group of siblings, who come from a long line of witches/warlocks, stowaway on their grandmothers magic bus in order to travel to the mysterious Halloweentown, where all the creatures of lore reside. 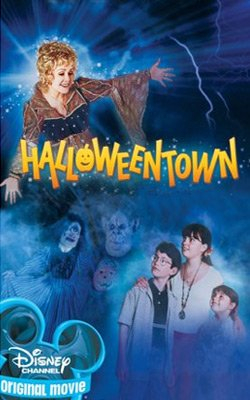 Once they arrive, they discover that evil forces are at work, and they must band together in an effort to return Halloweentown to normal. The Disney Channel original certainly is perfectly suited for Halloween. Goblins, witches, ghosts, and zombies are only a fraction of the denizens of the holiday themed town in which the film is set. 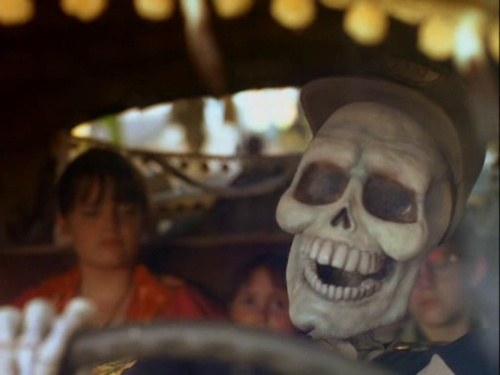 It features some impressive costuming and effects, particularly the skeletal cab driver. However, the film is hardly bound to be enjoyable to any viewer over the age of 13, whereas another film focusing on the notion of there being a mysterious other dimensional town for each of the US holidays is timeless and appeals to all ages. I found the jokes to be juvenile, the acting to be hokey, and the storyline to be formulaic. While I always find it enjoyable to see modern films with actors from the Golden Age of Hollywood, I’d rather it be in roles that I certainly could enjoy. Reynolds, playing the matriarchal role, is perfect, even in her over-the-top performance. The rest of the cast, however, appears to be trying, resulting in a stilted performance. Other elements of the story were simply tired, mere rehashes of other films, like Mary Poppins or Bedknobs and Broomsticks. However, newer viewers may not be entirely familiar with those more beloved classics, hence my assessment that the prepubescent crowd my be more entertained. Given a choice, and looking for a timeless fantastical story of magic, I’d rather settle for the aforementioned Nightmare Before Christmas, or either of other Disney classics mentioned above. It was a swealtering summer night in the suburbs of my hometown. My brother and I were spending another night with my cousin, looking forward to the traditional night of watching a double feature in the living room of his tiny downstair apartment. We loved to stay the night, as my aunt seemed to have no qualms about the type of films we would be allowed to view. Compared to my mothers restrictions on something as seemingly innocent as Strawberry Shortcake or The Care Bears, a film that featured any worldly vice or plot was like a trip to Fantasy Island. This night, my cousin was ecstatic. He had stated that he was a fan of both films on the bill, and was sure we would equally enjoy them. We turned down all of the lights, grabbed our individual servings of Jiffy Pop, and sat down to watch the first of our VHS tapes that night. Sleepaway Camp was the first feature. The second feature was the film I chose tonight for this series on frightful films during the month of October. I chose the film not because I remembered it as a classic, but because amazingly, I remembered nothing about either film prior to tonights viewing. I simply remembered the title of the films, and have wanted to revisit them both since my days as a youth. As I write this, I wish I could unremember once again. Years after witnessing the brutal murder of his parents, a young man goes on a murderous rampage, dressed as Santa, choosing those he deems as “Naughty” as his victims. What the 7734 were they thinking? My word, what a travesty. There is nothing about this film that I found enjoyable, frightening, intriguing, or any other emotion other than belwilderment. While I could remember nothing about the film (I must have blocked it from my memory upon my initial viewing), I was aware that it spawned 4 sequels. How that happened is beyond me. The film is a worthless slasher pic that was as painful to watch as Chinese Food by Alison Gold. I would have enjoyed it more had I miraculously experienced a Stay Tuned moment and found myself one of the victims of Billy’s axe to the stomach. The dialogue, acting, plot, deaths, costuming, sets, all are about as shallow as my toddlers swimming pool. 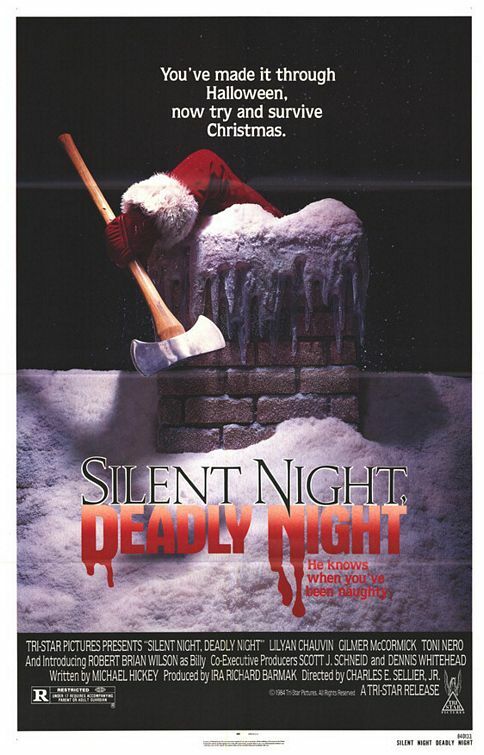 I understand that parents boycotted the film upon its initial release due to its subject matter of a killer Santa. I would rather have picketed the bank that funded this mess for wasting peoples money on such dreck. If you are as wanton as the un jovial man in red, by all means, rush out and rent this stinker. If you are of the same character as the family in the Saturday Night Live skit The Gross-Out Family, then ask for the collector’s DVD box set of this film for your Christmas gift. Otherwise, save yourself the misery and rent Misery instead. At least you’ll enjoy the maniac with an ax (or a hammer in the theatrical version) much more.